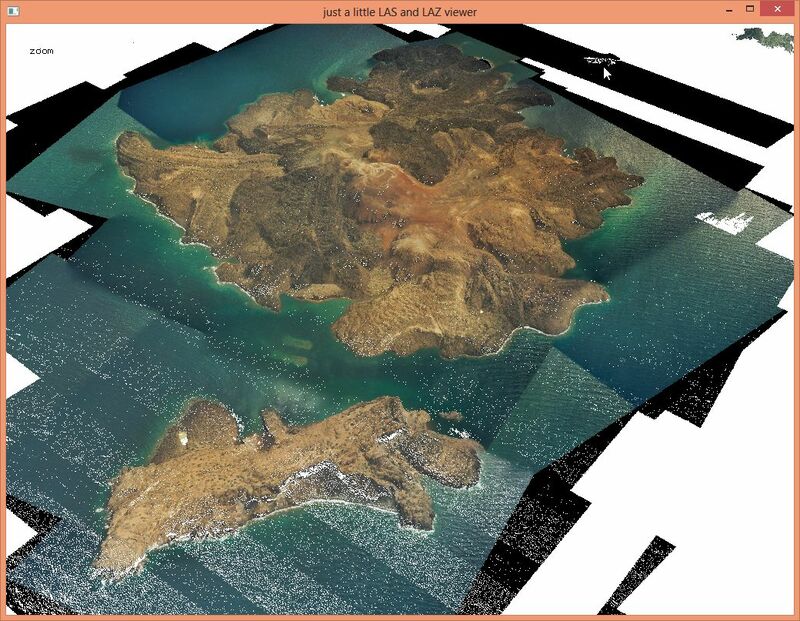 (1) The exporting software used the wrong GeoTIFF tag to specify the UTM 35 (north) projection via EPSG code 32635. 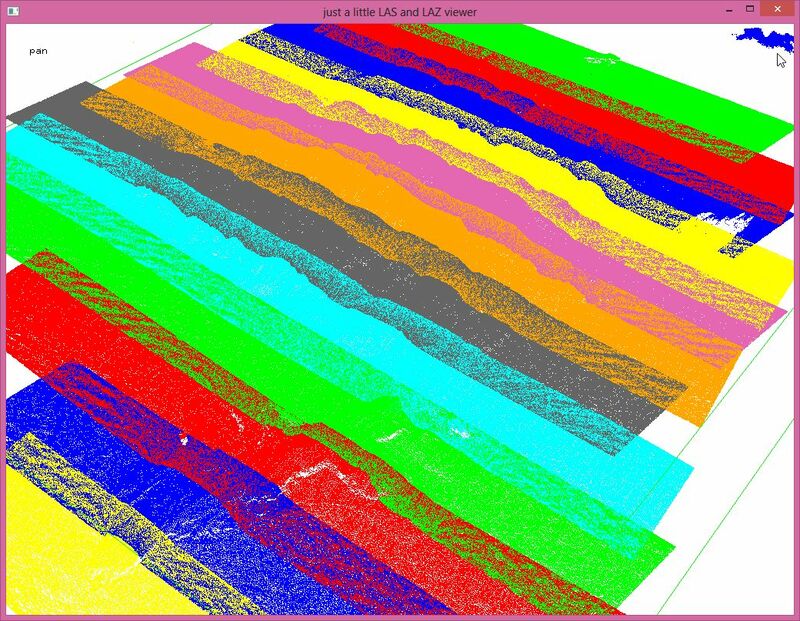 (2) There are four proprietary “LeicaGeo” VLRs totalling 22000 bytes stored in each header. Does someone know what they contain and how to read them? (3) There are two legacy bytes following the header that are part of the (now somewhat dated) LAS 1.0 specification. (4) The coordinates are stored with millimeter resolution (i.e. the scale factors are 0.001). This is an overkill for airborne LiDAR. Those millimeters are just scanning noise, are miss-leading, and negatively affect compression. (5) The file does not store flight line numbers in the “file source ID” field. (1) A cruise ship and a cloud was captured. the latter is classified as noise (7). (2) An intensity value is stored for each return. (3) Almost all laser shots resulted in a single return, which is not surprising for a vulcanic island without vegetation. The multi-returns from the cloud are a colorful exception. (4) There are some strange (=> useless) numbers stored in the “point source ID” field of each point that should really store the flight line number of each point. 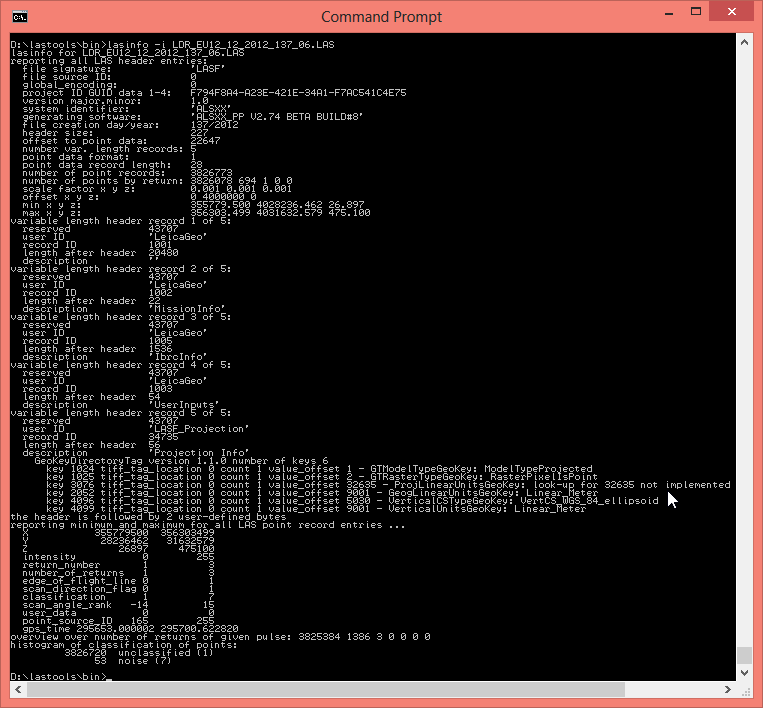 (1) Remove the legacy two bytes following the header. (2) Switch to the 1.2 version of the LAS format. (3) Remove all existing VLRs. (4) Set the horizontal projection to EPSG code 32635 and the vertical datum to WGS84. 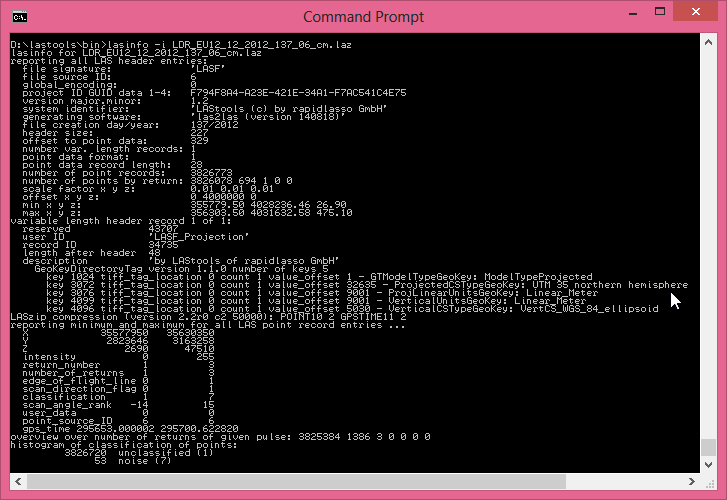 (5) Set the file source ID of each file and the point source ID of each point to the same value. This values starts at one and is incremented with each file. (6) Rescale coordinate resolution to centimeters. 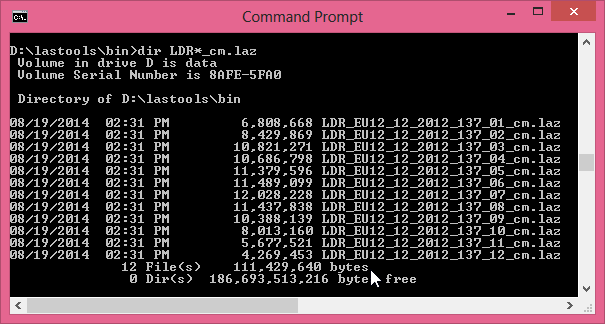 (7) Append the string ‘_cm’ to the original file name to output LASzip-compressed files that end in ‘*.laz’. This result in much much smaller files that are easier to host and faster to download. We achieve almost a factor 10 in compression as the new files are only 11.2 % of the size of the original files. And we now have flightline information that tells us, for example, that the (blue) cloud was captured by the third flight line. We noticed something odd when loading the files with lasview: Although most flightlines were still in acquisition order (i.e. the points in the file are in the order acquired by the scanner), flightline 8 and 10 were not. Perfectionists like us employ lassort with option ‘-gps_time’ and reorder all twelve files by GPS time on 4 cores in parallel. Such spatial indexing information (see the video of our ELMF 2012 talk for more details) allows faster spatial queries that only read and decompress the actually queried area-of-interest. This is already used by all LAStools and can be exploited via the LASlib application programming interface. Soon there will also be support for spatially-indexed queries in the LASzip compression DLL. 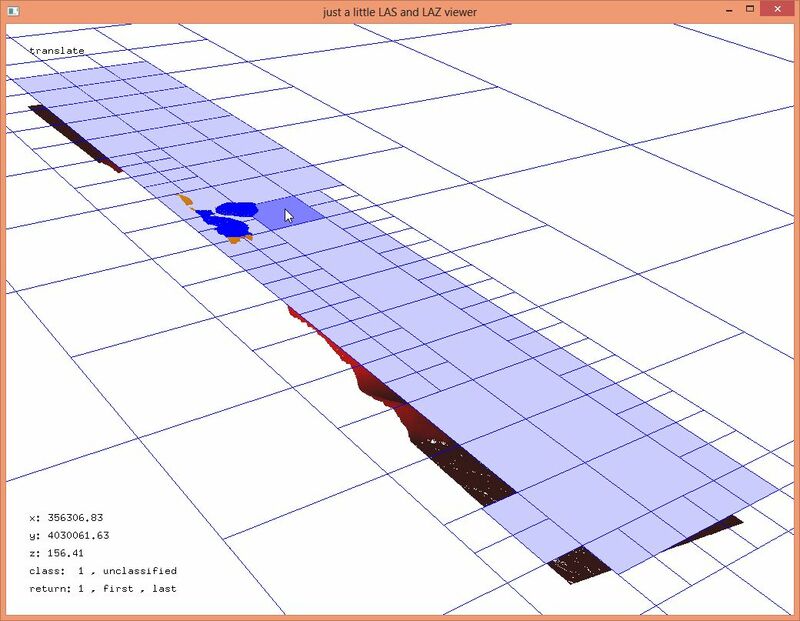 This entry was posted in compression, distribution, LAS, LASzip, LAX, LAZ, LiDAR, open data, spatial indexing, tutorials. Bookmark the permalink. Loading all twelve flightlines into lasview will make this obvious due to the order the points are drawn. 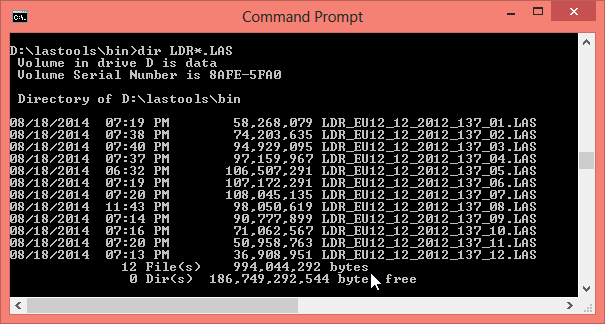 To do this just run “lasview -i LDR*.las”. Of course, the flightlines need to be GPS-time sorted and most of them are (except strip 8 and 10).